About N20 (215 x 24) 25 pcs. 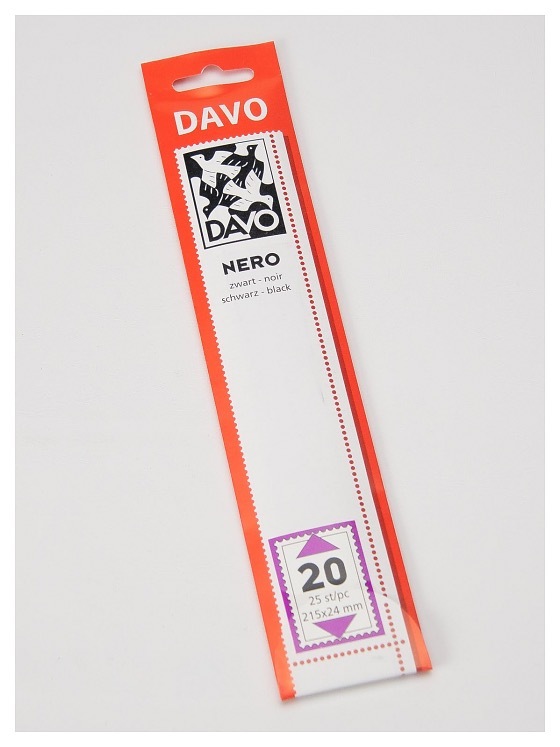 DAVO mounts consist of two joined synthetic foils, with which you can safely accomodate your stamps in the album. The lower of the two foil layers is provided with gum, so you can attach the mounts to your stamp album page by lightly moistening. All DAVO stamp albums and Luxe supplement pages are provided with DAVO Cristal mounts. In DAVO standard or DAVO standard-luxe albums you can put the mounts on yourself. DAVO Nero mounts have a transparent shining top layer with a black background. Price is per 25.